Nov 1, 2018 – TORRANCE, Calif. The 2019 Civic Type R and Civic Hatchback return with upgraded interior features, standard Honda Sensing® on Civic Hatchback, and Sonic Gray Pearl available on Civic Type R for the first time in the U.S. The changes build on the edgy styling, fun-to-drive nature, versatility and premium features that made Civic Hatchback and Civic Type R instant hits last year after joining the award-winning 10th-generation Civic lineup. The 2019 Civic Hatchback and Civic Type R go on-sale at Honda dealerships beginning Saturday, November 3 with a Manufacturer’s Suggested Retail Price (MSRP1) starting at $21,450 for Hatchback, and $35,700 for Type R (excluding $895 destination and handling). Both models benefit from multiple interior updates designed to provide drivers with a more comfortable and efficient in-vehicle experience. Enhancements to technology and connectivity include an updated Display Audio system that now features physical buttons and a volume knob for more intuitive control, improved voice recognition and Bluetooth® connectivity, a USB sub-cord and, similar to previous models, Apple CarPlay® and Android Auto™ integration standard on EX trims and above. In addition, steering wheel controls have been upgraded for simplified operation, the electronic parking brake has an indicator light for when it’s engaged, the center console sports larger cupholders, and there are physical buttons for fan speed on models with dual-zone climate control. At 20 percent of all Civic sales, Civic Hatchback is a key player in the Civic lineup, which continues as the top-selling retail car in America this year2 — a position it has held in each of the past two years. Civic Hatchback Sport, with its combination of eye-catching good looks and a dynamic driving feel, was named a 2017 AUTOMOBILE All-Star, a list dominated by sports cars and luxury marques. Civic Hatchback Sport, along with Civic Type R and Civic Si, also earned a coveted spot on the Car and Driver 10 Best list for 2018. Perhaps best of all, Civic Hatchback’s lively demeanor doesn’t detract from excellent EPA fuel economy ratings of 31/40/34 mpg3 (city/highway/combined) for the LX, EX & EX-L Navi trims with continuously variable transmission (CVT). For 2019, Civic Hatchback again will be available in LX, Sport, EX, EX-L with Navigation, and Sport Touring trims. It’s powered by a 1.5-liter DOHC direct-injected turbo in-line 4-cylinder with peak output of 174 horsepower4 in LX, EX and EX-L Navi trims. Civic Hatchback Sport and Sport Touring trims bump peak power to 180 horsepower4. Civic Type R stormed onto the U.S. market last year, with an exclusive 2.0-liter 306-horsepower direct-injected VTEC® Turbo 4-cylinder engine and 6-speed manual transmission with automatic rev matching. With an adjustable suspension that includes Comfort, Sport and +R modes, Civic Type R is suitable as a civil and practical daily driver, with 22/28/25 city/highway/combined EPA fuel economy ratings, or an aggressive track star that has shattered records at some of Europe’s most celebrated racing circuits, including the famed Nürburgring. Civic Type R has won numerous accolades since its introduction, including being named a 2018 AUTOMOBILE All-Star, and a 2018 Editor’s Choice by Car and Driver. On the racing front, Civic Type R TCR dominated the Pirelli World Challenge series by way of 11 podium finishes over the 12-race season en route to the championship. 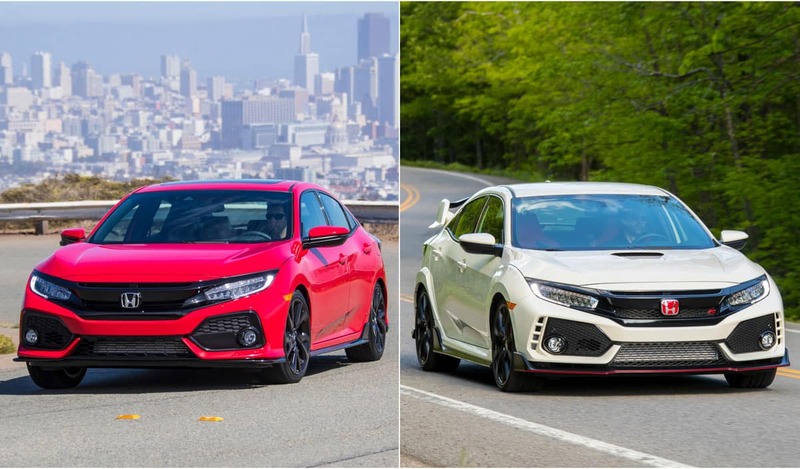 The 2019 Civic Hatchback and Civic Type R for the U.S. market are both manufactured exclusively by Honda’s Swindon, UK plant. The 2.0T engine for Civic Type R is produced in Honda’s largest automobile engine plant, in Anna, Ohio, using domestic and globally sourced parts. For more in-depth information, plus video and high-resolution images, please visit www.hondanews.com/channels/civic. Consumer information is available at www.automobiles.honda.com/civic. 1. MSRP excluding tax, license, registration, $895 destination charge, and options. Dealer prices may vary. 2. Based on Urban Science retail sales data for all models in the industry 2018CYTD July. 3. Based on 2019 EPA mileage ratings. Use for comparison purposes only. Your mileage will vary depending on how you drive and maintain your vehicle, driving conditions and other factors. 5. MSRP excluding tax, license, registration, $895 destination charge, and options. Dealer prices may vary. 6. Based on 2019 EPA mileage ratings. Use for comparison purposes only. Your mileage will vary depending on how you drive and maintain your vehicle, driving conditions and other factors.